Continuing our quest in pursuit of the obscure, last issue's Mercury Hermes naturally leads us on to another scootering oddity, due to trading associations between the two companies. Our remarkable feature machine was built at Hounslow in Middlesex, and fitted with its own-make, all British, 50cc, 4-stroke engine! We test - the Dunkley Popular scooter! W H Dunkley established as a perambulator manufacturer at Jamaica Row, Birmingham from 1874. Versatility was the key to survival in Victorian times and a catalogue of 1880 illustrates their imagination, "Prams, rocking horses, see-saws, pedal tricycles, hobby-horse tricycles, mail carts, steam circuses & roundabouts with organ complete"! In 1886 they commenced production of a series of 'gas cars', which came equipped with a rubber tube for refilling off gas street lamps! Various models of motor cycles appeared around 1913, and a 3½hp Dunkley fitted with a 499cc Precision engine was entered into the 1914 Senior TT by G N Norris. It completed 3 laps before retiring. Despite diversions into other varied products, prams remained a constant in the core business. Appearing at the 1922 Motor Show, and powered by a 1hp Simplex engine, The Pramotor was a mind-boggling creation! Even more staggering, listed in 1924, was a Pramotor 750cc V-twin with direct drive - it must have taken a mean nanny to bump start one of those! Production of motor vehicles ended in 1925, from when the Dunkley name became synonymous with prams, leading to their position as the premier manufacturer. By the mid 1930s, W H Dunkley & Dunkleys Ltd had amalgamated with the Kensington Baby Carriage Co and acquired showrooms in the West End of London. Prams carried through up to their return to 2-wheelers in April 1957, with the introduction of the Dunkley Whippet 60. This machine, described as a 'Scooterette', had first been exhibited the previous year at the Earls Court Show in November 1956, branded as the Mercury Whippet 60 and painted in Eggshell Light Blue. Though sales leaflets were printed and circulated to the trade, the machine never progressed beyond the show model under the Mercury badge; however Dunkley did sell a number of their early Whippets finished in the same colour, presumably using up the paint? The Whippet's main pressed steel frame elements were of Italian origin, but it's difficult to be sure of the exact source since several manufacturers seem to have used them, Peripoli and Bianchi being mooted as favourites. Further chassis additions to adapt mounting of the engine and headstock bore all the hallmarks of Dunkley's industrial grade handiwork. The front forks and petrol tank were common parts to Mercury's Mercette, a moped powered by a variant uf the Dunkley engine, which appeared much earlier in 1955, though Dunkley continued using these cycle components after Mercury's collapse in March 1958, so presumably Dunkley were actually making them? The Dunkley Whippet Sports 65 motor cycle (seemingly based on Bianchi cycle parts) was introduced on 3rd October 1957, and their pram manufacture declared as 'reduced' in November. The Dunkley S65 scooter was announced on 30th January 1958, again being an imported chassis installed with their 'house' motor. The S65 chassis variously appeared across the continent in several guises, fitted with a 50cc Demm engine in the Casalini, a Swiss-built Ticino model, the Dutch Typhoon Bromscooter 'David B.48', and sold in Italy under the Giuiletta brand, once again leading back to Peripoli. 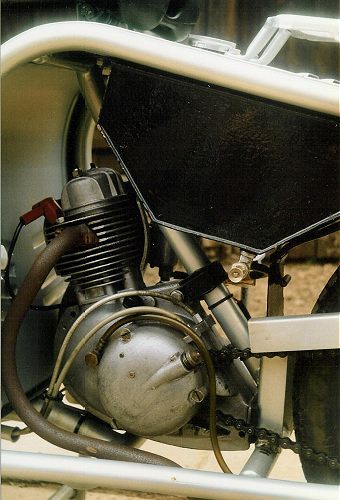 Designed by Bruno Fargion after moving on from Sinclair Goddard (Power-Pak), the Dunkley engine has 2-speed hand shifted ratios, with the cam lobes located on the gear input shaft between 1st & 2nd! The reduction primary drive gear train is indexed to maintain the valve timing, so the dry plate clutch is mounted off the end of the output shaft between the gearbox and final drive sprocket - it's all very unconventional and you're not too sure how that crash change gearbox is going to work! The kickstarter ratchet mechanism spins the motor over back through 1st gear in the neutral position. A Wipac Series 90 flywheel magset hangs off the RH side crank journal so runs a wasted spark on the 4-stroke cycle, while the engine is wholly reliant on splash/mist lubrication from little more than a teacup of oil! 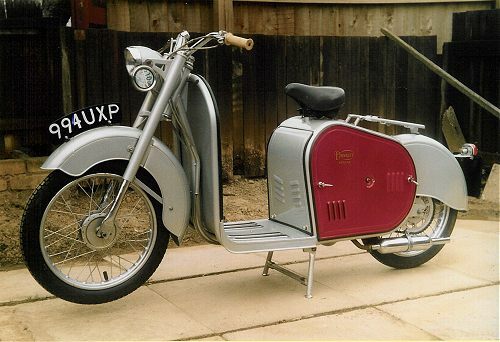 August of 1958 saw the introduction of Dunkley's first 'all British' Popular 49cc scooter - and compared to the Latin styling flair of the S65, looked every bit like a typical home-brewed job! If a picture says a thousand words, then the original advertising illustrations probably weren't making the best of selling the machine, since when we meet the Popular - it seems to look so much nicer than those period pictures! With bright silver/grey bodywork and red metallic panels, this looks really smart! Bearing frame number 403 and engine 4115, this example was registered in July 1958. Looking around the bike, it has undamped telescopic forks with rigid tail, and you've got to spot those neat cable guides on the front downtube. The centre stand offers a particularly stable base with the legs spaced to the full width of the footplate, and snaps up and down with a positive and solid action too. The speedo hole in the headlamp shell is closed by a metal blanking disc, and there's a small parcel rack behind the seat, bridging the body section to the rear mudguard - overall, the impression is a clean, practical, and unfussy machine. We like this! Front forks are the Mercury/Dunkley scooter variant form, with handlebars clamped to the top yoke (Whippet models fitted a stem mounted set). Dunkley's Popular hides all its working parts away in typical scooter fashion, behind chic and stylish bodywork, so let's remove the side panels to see what makes it tick. Each panel is fixed by two quick release spindle wingnuts, on sturdy 3/8" cycle threads, with a firm and secure action. When you get the right panel off there's a tool pocket welded to the inside of the cover so everything is ready at hand when you're there to want it - a thoughtful touch! Examination of the cast alloy fan-cool ducting doesn't really convince that it's much of a 'forced air' system - small vanes on the flywheel in a 'spacious' open backed housing suggest an 'air stirring' process is more likely to be what is actually happening! 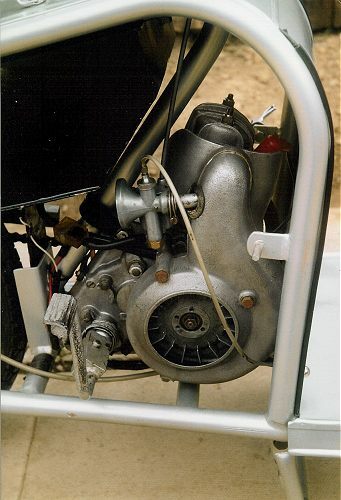 The pushrod motor breathes as a crossflow, with the curly exhaust pipe sweeping away on the left, and a tiny 3/8" bore Amal 362 carb feeding down a curving tubular steel manifold on the right. Unlike the much lighter Mercury Mercette moped, the Popular cannot be pedal assisted in times of need, so Dunkley worked some tweaks with their kickstart scooter engine version. While the Mercury engine of 39mm bore × 39mm stroke gives 46.6cc at 6.5:1 compression for 2bhp, Dunkley reworked their Popular version of the base motor with a slightly longer stroke for 39mm bore × 41.5mm stroke giving 49.6cc at 7:1 compression for 2.2bhp. The higher compression helps acceleration, hill climbing, and into headwinds, while the 10T-48T sprockets on 20" road wheels calculates to a final drive ratio lowered by 13.5% against the Mercette, ensuring it should never be found lacking against an incline. Despite the good turning circle, the length of this machine does make it rather cumbersome trying to negotiate tight spaces, it's 6ft 6in long and doesn't navigate too well along narrow passageways round the side of the house... oops, scratched the paint on the apron... Doh, caught the handlegrip end... Darn, that's the rear number plate now! Fuel on by pull plunger through the right hand side panel. Choking is operated by a cable linkage emerging below the saddle, pull to choke up, which raises a needle to fill the reserve chamber. 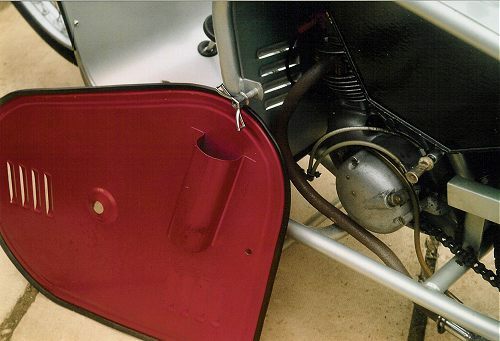 Owners tip - lean the Popular hard over to the right for 20 to 30 seconds, as it has the effect of further flooding the carb, and may make starting a whole lot easier on cold days. Starting can be a bit quirky due to the Dunkley curse of plug oiling and wetting, but clean the plug, and once going, it'll be fine, then a couple of prods on the kickstart, and the Popular thunders into life. The little 4-stroke thumper, sounds like it really means business! Clutch, twist into first with a clunk, wind on the throttle while feeding in the lever - and surge up the road, roaring away with a pretty impressive sounding take-off on the tiddler launch scale! Popular sounds nothing like it looks, a little scooter that pretends to be a big motorbike! Clutch, switch smartly through the change up to second, and gone are all the faltering carburetion and flat spots that plague the Whippet and Mercette, as the little 4-stroke eagerly bounds toward a steady 30mph cruising speed. The Dunkley sounds strong and confident at the urban limit, and there's still a shade more in reserve if you want to push it hard; Popular road tested at 34mph top speed. With the lowered gearing anyway, speed isn't much at issue with Popular, it more than makes up with a docile manner and practical rideability. The 'restricted' carburetion also seems to prevent the engine from being revved out; it just gets up so far and won't really go anymore - probably a useful characteristic for customer warranty! The twitchy handling peculiarities of the nervously light Dunkley Whippet in no way carry over to the family scooter; in complete contrast, the Popular is confidently stable and firmly planted on the road. The long wheelbase (52½ inches), probably contributes toward Popular's exemplary behaviour, supported by the proven wheel plan of 20"×2½" tyres (same size as Ariel Pixie, Sun Geni, Mercury Hermes, Dolphin and Pippin etc), on 15" Dunlop rims, laced to B H Co hubs. Braking benefits from the laws of physics with the relatively smaller wheels, so both stoppers work well, and injudicious pressure on the foot pedal can even cause the rear to lock up. The riding position is similar to the Mercury Hermes, with a slightly hunched forward posture - but Popular is better as there's plenty of space to get your feet properly onto the floor plate. The scooter panelling effectively contains and muffles the usual Dunkley motor noise, so Popular sounds lovely and smooth, and all you hear is the happy thumping exhaust note. Even at low speed the motor ticks like a clock, and the dry clutch remains completely un-fussed when trickling through queued cars to get to the front at the traffic lights. Despite the limitation of having only two gears, Popular's low drive ratio is fairly unconcerned about hills, and with little inclination to change down, invariably manages most inclines in top, while if you do actually stop at the bottom, first is low enough to permit quite effective hill starts. Lights are controlled by the common Miller 5-way combination switch at the handlebar: off/beam/dip/horn/kill, but actual headlamp illumination is limited to a dull golden glow. Dunkley's path was paved with bankruptcies, but the characteristic script logo plainly carries across history from the 1920s, through cars, motor cycles and prams, to the scooters and light motor cycles of the late '50s. Somehow, they always bounced back, until spring of 1959 when it was announced that Dunkley Products Ltd had been taken over by M G Holdings Ltd, who advised the further acquisition of Dayton Cycles in May 1959, and that Dunkley production was being transferred to the Park Royal site. Despite encouraging propaganda claims issued by the new management, it seemed little more than an asset stripping exercise and building out of stock, as the Dunkley range was dropped at the end of 1959. There are very few known surviving examples of the Popular, the Dunkley register recording only 3 complete and viable machines, a couple of ruinous wrecks, and an odd few spare engines. Popular engine numbers are indicated by Glass's Index starting from serial 4036 and frame number 321 in August 1958. Closing records from production in Dunkley's disrupted final phase never seem to have come to light, so only register entries can give some indication as to how many Populars were actually made, the highest recorded engine serial being 4751, suggesting around some 800 machines completed. 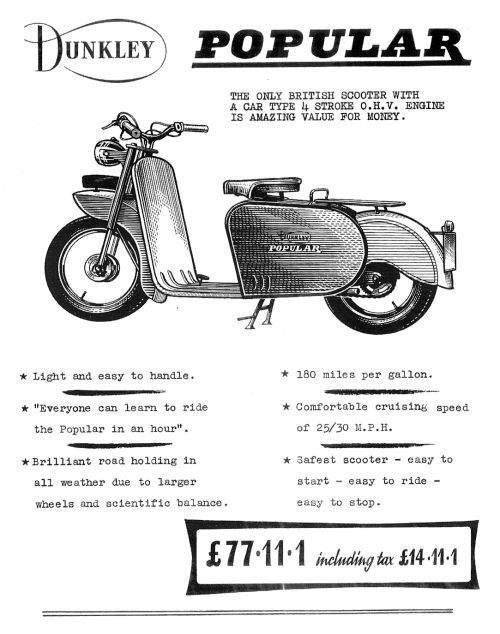 From the last Dunkley advertisements appearing during the M G Holdings twilight chapter, indications suggest the 65cc Popular Major Scooter was probably the final product, introduced from December 1958 at engine serial S709/frame 785. The 'Major' is even rarer, with only one example presently believed to survive. Dunkley's former site of National Works at Hounslow was shortly occupied by Scootamatic for local distribution of their listed imported motor cycles, scooters and Auto-Vap mopeds. Dayton products were also finished after the sales season of 1960, and by February 1961 it was announced that all remaining Dayton and Dunkley spares had been disposed to Viscount Motors Ltd, London W13. This article appeared in the Jan/Feb 2007 magazine of the Vintage Motor Scooter Club. It is reproduced here with the author's permission.